The historic first game at Wildcat Stadium saw the Wildcats beat Houston Baptist, 24-3. 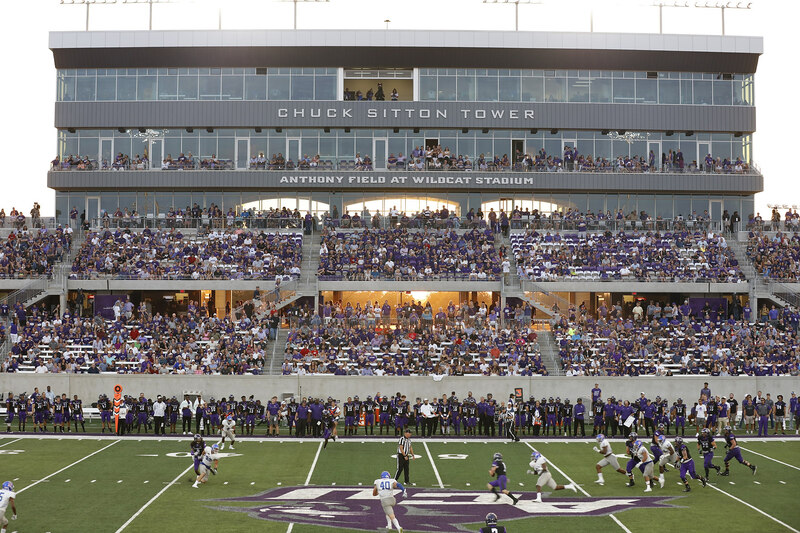 Abilene Christian University took defending its new home turf quite literally Saturday night, limiting Houston Baptist University to 129 yards of offense in a 24-3 win before a sellout crowd in the inaugural game at Anthony Field at Wildcat Stadium. ACU improved to 1-2 overall and 1-0 in the Southland Conference, playing a home game on campus for the first time since 1958. HBU fell to 1-2 and 0-1 in the Southland. The Wildcats set a defensive tone early, limiting the Huskies to 18 yards of passing and 76 total yards in the first half. Abilene Christian, which played several miles from campus at Shotwell Stadium for 57 full seasons, opened the scoring when De’Andre Brown scampered 5 yards for a touchdown in the first quarter. HBU countered with a 54-yard field goal by Alex Chadwick. Wildcat quarterback Dallas Sealey tossed a 33-yard scoring pass to Carl Whitley with 38 seconds left in the first half and Nik Grau added a 23-yard field goal at the start of the fourth quarter. Luke Anthony wrapped up ACU’s scoring with a 17-yard TD throw to Josh Fink with 2:03 left in the game. Sealey completed 28 of 38 passes for 195 yards and a TD. Tracey James led ACU in rushing with 56 yards and Sealey scrambled for 46. HBU managed just seven first downs against the inspired Wildcat defense. Linebacker Garrett Dolan had 16 tackles for HBU and safety Nicholas Smith added 12 and one interception. Bailey Zappe and Jack Swenson teamed to complete just 11 passes for 60 yards. Terrace Peters led all rushers with 68 yards. The Wildcats continue Southland Conference play next Saturday when it hosts a 6 p.m. game with Stephen F. Austin on ACU’s Family Weekend. HBU will play McNeese at 6 p.m. in Lake Charles, Louisiana.